Great news! This blog is growin’ up, and moving to its new home at Artillery Magazine! The Art Minion Column for Artillery Magazine is a platform through which I can help make the fine art world more accessible to disenfranchised communities by amplifying female and minority artists’ voices. 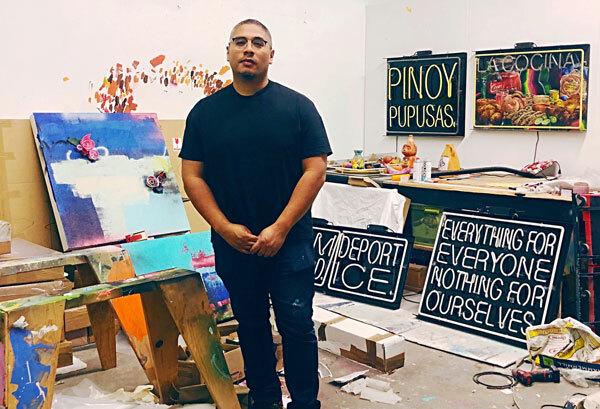 My first piece for the column features Patrick Martinez, who is most well-known for his neon signs that remix advertisements as political calls to action, and multi-media “combined landscape wall works” that could have been pulled from the gritty streets of LA. I’m a huge fan of his work, and I think you will be, too! Did you get a logo made? We ended up making the logo on our own! I’m happy with the way it turned out. Thank you!